You're probably thinking this isn't your responsibility. Surely a good candle manufacturer would craft a candle with a perfectly centered wick from top to bottom. Well, of course that's the goal, but during the pouring process the wick can get pushed to the side. The wick is still centered on the bottom where the base was glued to the bottom, and they are sure to center it on the top before the wax sets, but what happens in between is a guessing game many times. A good candle maker will adhere to all the safety precautions during the manufacturing process, using the correct materials and standards, but when the candle is burning, the responsibility is on the owner to make sure they provide the right environment and monitor the conditions. (This is where the "Never burn a candle out of sight" warning comes from.) If things to awry, it's up to you to make the necessary adjustments. 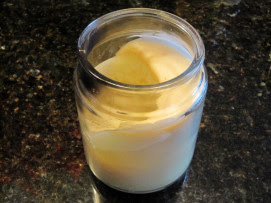 If you see the wick "creeping" to the side (it isn't actually moving or creeping, it's just hardened in the wax with a slight bend to it) this creates a pour burn quality and, more importantly, becomes a safety issue. With the wick off-center, the candle will burn unevenly and likely form soot on the side of the glass where the flame is too close. 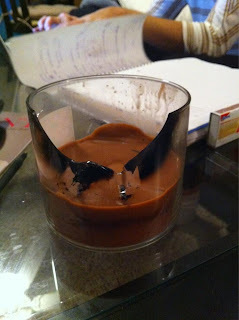 This is unsightly and you won't get all the hours out of your candle. It may stop burning at all as it drowns itself from too much wax melting down on top of it. Bad, but not the end of the world. What happens if this is left unadjusted, however, is quite bad. The glass can get too hot and can crack. The usual response is "My candle exploded!!". Wax can spill out everywhere causing a mess and an uncontrolled fire can create a significant hazard. Use a wick dipper or wick tweezer to re-center the wick. Sink the wick dipper or tweezer down into the melted wax about 1/2" and use it to GENTLY push the wick towards the center. You never want to pull on the wick as you could end up pulling the wick completely out of the candle, and that doesn't take Popeye strength to do. Let the wax harden before you relight. When you relight the candle, the wick will start in the center and burn correctly. If it starts to creep again after a while, repeat the process above as many times as necessary. Again, the consequences of not keep in things in check just aren't worth it!! A little candle maintenance goes a long way. This is a public service announcement brought to you from Safety Sue.